In coastal locations instantly recognisable dense mats of Sea Campion lie like summer snow along the cliff tops, sometimes even peeping up through banks of sandy shingle. Up to 30cm in height, these perennial wildflowers form low, broad cushion-like plants. Sea Campion has hairless grey-green waxy leaves which are lanceolate, stalkless and in opposite pairs on the grey-green stems. Each with five bi-lobed petals, the flowers range from 2 to 3cm across and either pure white or white with a hint of pink or mauve. Flowers are borne usually singly or very few in a cluster and on upright stems, unlike othercampions which tend to produce many flower heads on one stem. Behind the corolla there is an inflated green-tinged fused calyx, which is five-lobed and lined with reddish-purple or reddish-brown veins. 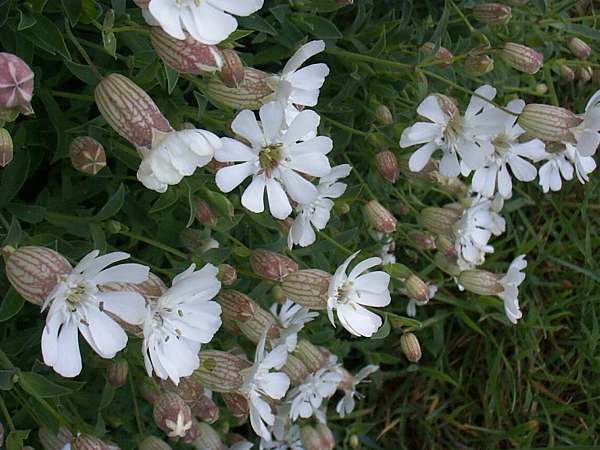 As with other member of the genus Silene, the unscented flowers are dioecious, which means that the male and female flowers occur on separate plants. Sea Campion is found along much of the coast of Britain and Ireland and in a few low-lying inland locations on limestone habitats in north-west England and western Scotland. Silene uniflora is found on coastal cliffs from Scandinavia down to north-west Spain and Portugal and on Madeira. 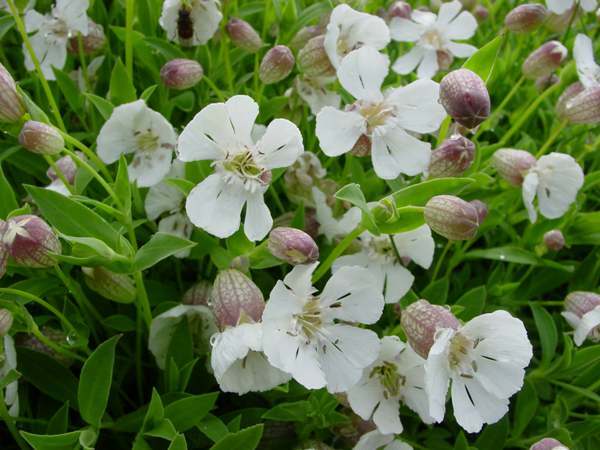 Sea Campion is an introduced species in other parts of the world including Australia. A plant of coastal cliffs, sand-dune systems and gravel banks, Sea Campion also occurs in a few localised lowland sites away from the coast, notably where thin soil overlays a limestone substrate. 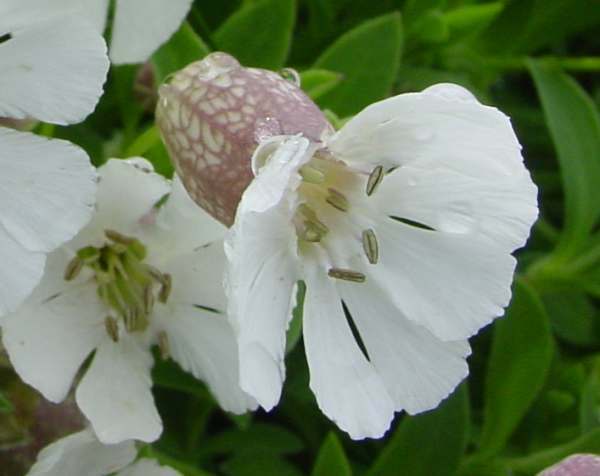 In Britain and Ireland the first flowers of Sea Campion appear in late March, and the floral displays are at their finest from late May (especially when interspersed with patches of Bluebells and Red Campion) until the end of June. Flowering usually continues until late September and often a few stragglers can be found well into October in sheltered coves. Silene, the genus name, is a reference to the Greek woodland god Silenus the foster father of Bacchus, who was often depicted covered in a sticky foam and whose name in turn comes from the Greek word for saliva. (The female flowers of Red Campion secrete a frothy foam that captures pollen from insects that come to the flowers to gather nectar.) The specific epithet uniflora signifies that flower stalks of Sea Campion generally bear just a single flower, although this is not always the case. Plants of the genus Silene have roots that contain the compound saponin, which although a mildly toxic substance has long been used as soap for washing clothes, hair etc. There are references to some kinds of campion being used to treat snake bites and as a cure for corns and warts. 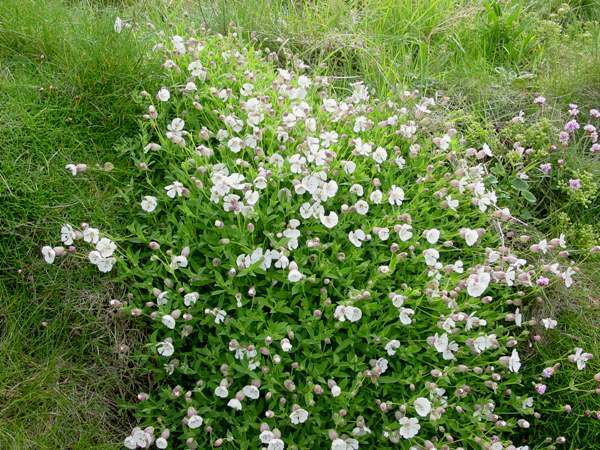 Sea Campion is sometimes mistaken for Bladder Campion Silene vulgaris, a taller plant withgreatly enlarged sepal tubes, and less often it is confused with White Campion Silene latifolia, whose flower does not have an inflated calyx. 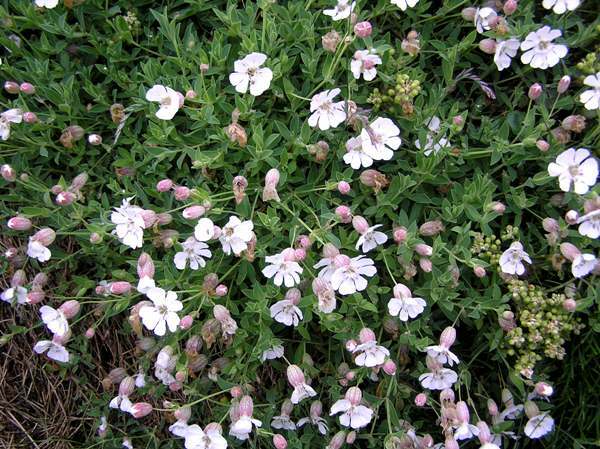 The pictures of Sea Campion shown on this page were taken in Pembrokeshire in West Wales during June.